Shirzadpour, F., Kashani-Amin, E., Ebrahim-Habibi, A. (2015). Bacillus Amyloliquefaciens Alpha-amylase Inhibition by Organic Solvents: A Study on Methanol, Ethanol and Propanol. Biomacromolecular Journal, 1(1), 113-121. Fatemeh Shirzadpour; Elaheh Kashani-Amin; Azadeh Ebrahim-Habibi. "Bacillus Amyloliquefaciens Alpha-amylase Inhibition by Organic Solvents: A Study on Methanol, Ethanol and Propanol". 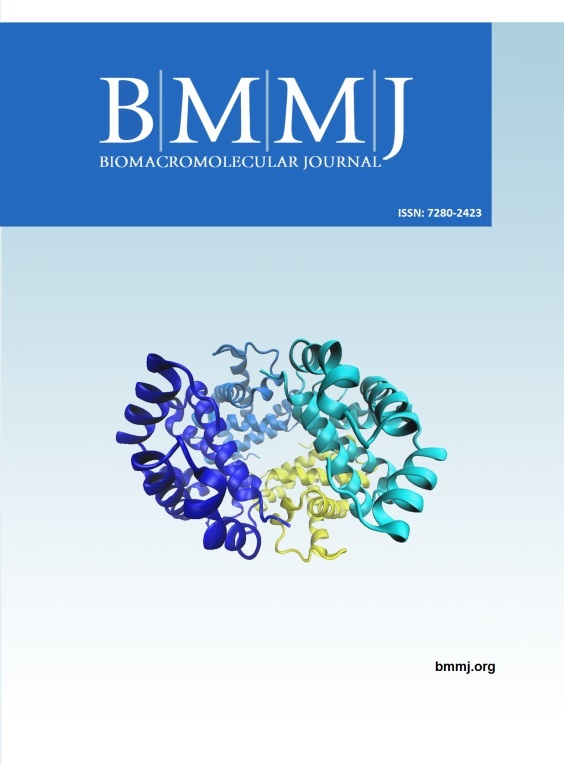 Biomacromolecular Journal, 1, 1, 2015, 113-121. Shirzadpour, F., Kashani-Amin, E., Ebrahim-Habibi, A. (2015). 'Bacillus Amyloliquefaciens Alpha-amylase Inhibition by Organic Solvents: A Study on Methanol, Ethanol and Propanol', Biomacromolecular Journal, 1(1), pp. 113-121. Shirzadpour, F., Kashani-Amin, E., Ebrahim-Habibi, A. Bacillus Amyloliquefaciens Alpha-amylase Inhibition by Organic Solvents: A Study on Methanol, Ethanol and Propanol. Biomacromolecular Journal, 2015; 1(1): 113-121. Alpha-amylase is widely used as an industrial enzyme, and a therapeutic target for which inhibitors are designed. Organic solvents are used to dissolve various compounds that would be studied as moderators of alpha-amylases, but they could themselves affect enzyme activity and stability. Methanol, ethanol and propanol are simple alcohols that may be commonly used to this end, and their effect has been investigated on the activity and stability of Bacillus amyloliquefaciens alpha amylase (BAA) enzyme. 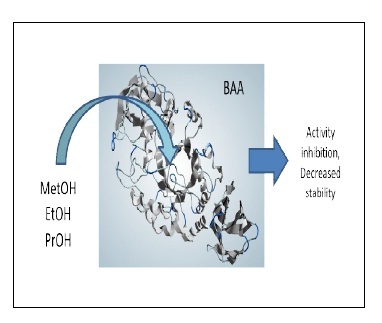 All three compounds were found to reversibly inhibit BAA, with methanol decreasing the binding affinity of substrate to BAA, and ethanol and propanol showing mixed type of inhibition. A docking experiment suggests the existence of a common binding site for the three alcohols. The proposed site is located near to one calcium binding site of the enzyme, a fact that correlates with the reduced thermal stability of BAA in presence of all three alcohols. In conclusion, the dose dependent inhibition of these solvents should be taken into account when studying the effect of moderators. M.N. Gupta, I. Roy, Eur. J. Biochem.271 (2004) 2575. C. Laane, S. Boeren, K. Vos, C. Veeger, Biotechnol. Bioeng.30 (1987) 81. D. Gangadharan, K.M. Nampoothiri, S. Sivaramakrishnan, A. Pandey, Appl. Biochem.Biotechnol.158 (2009) 653. S. Ponnusamy, S. Zinjarde, S. Bhargava, P. Rajamohanan, A. RaviKumar, Food Chem.135 (2012) 2638. B. Svensson, M. Tovborg Jensen, H. Mori, K.S. Bak-Jensen, B. Bonsager, P. K. Nielsen, B. Kramhoft, M. Prætorius-Ibba, J. Nohr, N. Juge, BIOLOGIA-BRATISLAVA-57 (2002) 5. W. Aehle, O. Misset, Biotechnology Set, Second Ed. (1999) 189. R. Gupta, P. Gigras, H. Mohapatra, V.K. Goswami, B. Chauhan, Process Biochem.38 (2003) 1599. J. Alikhajeh, K. Khajeh, B. Ranjbar, H. Naderi-Manesh, Y.H. Lin, E. Liu, H.H. Guan, Y.C. Hsieh, P. Chuankhayan, Y.C. Huang, J. Jeyaraman, M.Y. Liu, C.J. Chen, Acta Crystallogr. Sect. F Struct. Biol. Cryst. Commun.66 (2010) 121. G.D. Brayer, Y. Luo, S.G. Withers, Protein Sci.4 (1995) 1730. K.Y. Hwang, H.K. Song, C. Chang, J. Lee, S.Y. Lee, K.K. Kim, S. Choe, R.M. Sweet, S.W. Suh, Mol. Cells7 (1997) 251. A.E. Habibi, K. Khajeh, H. Naderi-Manesh, B. Ranjbar, M. Nemat-Gorgani, J. Biotechnol.123 (2006) 434. S.-H. Yoon, J.F. Robyt, Carbohyd. Res.338 (2003) 1969. N. Mahmood, Comparative Clinical Pathology(2014) 1. T. Fukushima, T. Mizuki, A. Echigo, A. Inoue, R. Usami, Extremophiles9 (2005) 85. S.H. Yoon, J.F. Robyt, Enzyme Microb. Tech.37 (2005) 556. A. Levitzki, M.L. Steer, Eur. J. Biochem.41 (1974) 171. N. Aghajari, G. Feller, C. Gerday, R. Haser, Protein Sci.11 (2002) 1435. R. Maurus, A. Begum, L.K. Williams, J.R. Fredriksen, R. Zhang, S.G. Withers, G.D. Brayer, Biochemistry47 (2008) 3332. E. Kashani-Amin, P. Yaghmaei, B. Larijani, A. Ebrahim-Habibi, Obesity Research & Clinical Practice. E. Kashani-Amin, B. Larijani, A. Ebrahim-Habibi, FEBS lett.587 (2013) 652. E. Kashani-Amin, A. Ebrahim-Habibi, B. Larijani, A.A. Moosavi-Movahedi, J. Mol. Recognit.(2015). M.J. Kim, S.B. Lee, H.S. Lee, S.Y. Lee, J.S. Baek, D. Kim, T.W. Moon, J.F. Robyt, K.H. Park, Archives of biochemistry and biophysics371 (1999) 277. S.B. Larson, J.S. Day, A. McPherson, Biochemistry49 (2010) 3101. T. Honda, Y. Kaneno-Urasaki, T. Ito, T. Kimura, N. Matsushima, H. Okabe, A. Yamasaki, T. Izumi, Drug Metab. Dispos42 (2014) 326. S. Ponnusamy, S. Zinjarde, S. Bhargava, P.R. Rajamohanan, A. Ravikumar, Food Chem.135 (2012) 2638. E. Lo Piparo, H. Scheib, N. Frei, G. Williamson, M. Grigorov, C.J. Chou, J. Med. Chem.51 (2008) 3555. B. Nickavar, L. Abolhasani, Iran. J. Pharm. Res.12 (2013) 57. L.K. Williams, C. Li. S.G. Withers, G.D. Brayer, J. Med. Chem.55 10177. M. Najafian, A. Ebrahim-Habibi, N. Hezareh, P. Yaghmaei, K. Parivar, B. Larijani, Mol. Biol. Rep.38 (2011) 1617. B. Nickavar, G. Amin, C. Zeitschrift fur Naturforschung, J. Biosci.65 (2010) 567. R.M. Perez-Gutierrez, M. Damian-Guzman, Biol. Pharm. Bull.35 (2012) 1516. P. Meng, Y. Guo, Q. Zhang, J. Hou, F. Bai, P. Geng, G. Bai, Carbohyd. Res.346 (2011) 1898. A. Sokocevic, S. Han, J.W. Engels, Biochim. Biophys. Acta1814 (2011) 1383. P. Bernfeld, Methods in Enzymology I(1955) 149. M. Dixon, E.C. Webb, Enzymes. Academic Press,New York332 (1979). I.H. Segel, Enzyme Kinetics, Wiley, New York, 1993. A. Saboury, J. Iran. Chem. Soc. (JICS)6 (2009) 219. A. Saboury, M. Alijanianzadeh, J. Chin. Chem. Soc.55 (2008) 937. O. Trott, A.J. Olson, J. Comput. Chem.31 (2010) 455. S.R. Mikkelsen, E. Cortón, Bioanalytical Chemistry, John Wiley & Sons, Inc., 2004. W.W. Cleland, Adv. Enzymol Relat Areas Mol. Biol.29 (1967) 1. A. Tanaka, E. Hoshino, J. Biosci. Bioeng.96 (2003) 262. A.A. Saboury, Biologia, Bratislava57 (2002) 221. H.S. Oh, K.H. Kim, S.W. Suh, M.-U. Choi, Korean Biochem. J.24 (1991) 158. A. Tanaka, E. Hoshino, Biochem. J.364 (2002) 635. M. Gupta, EJB Reviews, Springer Berlin Heidelberg, 1993. A.D. Blackwood, C. Bucke, Enzyme Microb. Tech.27 (2000) 704. H. Ogino, H. Ishikawa, J. Biosci. Bioeng.91 (2001) 109. V. Uchaipichat, P.I. Mackenzie, X.-H. Guo, D. Gardner-Stephen, A. Galetin, J. B. Houston, J.O. Miners, Drug Metab. Dispos. 32 (2004) 413. Z. Ghalanbor, N. Ghaemi, S.-A. Marashi, M. Amanlou, M. Habibi-Rezaei, K. Khajeh, B. Ranjbar, Protein Peptide lett.15 (2008) 212.